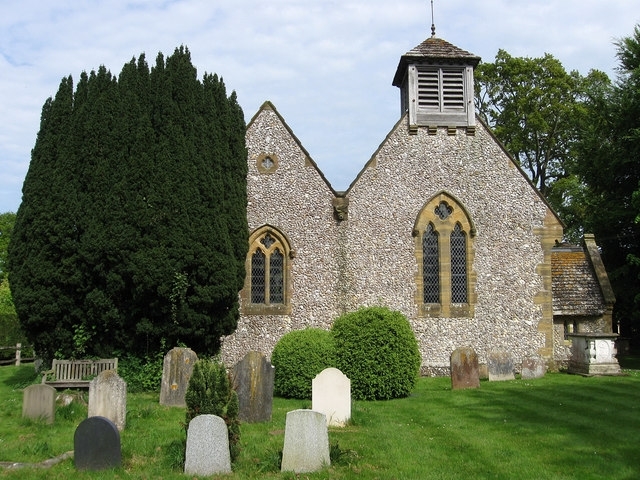 The church of ST. BARTHOLOMEW (the dedication is recorded from 1442), is of flint with stone dressings and consists of chancel, nave with north aisle and bell turret, and south porch. It was largely rebuilt in the 19th century. The chancel walls are late 11th- or early 12thcentury; the south chancel window is of that period, and a matching north window existed in 1851. The chancel arch, with chevron mouldings, is a 19th century copy of the original one, some stones of which are incorporated in the churchyard wall. The east wall of the chancel has Norman imposts, which may be the remains of an apse; the wall was rebuilt in the 13th century, with a lancet window later renewed. A brick south porch was built in 1641, possibly at the expense of John Juxon of Albourne Place, since its flanking pilasters and crow-stepped gable matched that building in style. The chancel was 'beautified' by the rector shortly before 1724; possibly about that date the ceiling mentioned c. 1776 was added. A west gallery was begun in 1723 or 1724, and also existed c. 1776. A bell turret with a pyramidal cap was depicted in 1777. About 1827 a north transept was added at the expense of Charles Goring. The church was entirely rebuilt, except for part of the chancel, in 1853; the architect was Gilbert Scott, and the cost was defrayed by the Revd. J. Goring. A north aisle of three bays replaced the transept, the chancel arch was rebuilt in new stone, and a new bell turret and south porch were put up. The plain octagonal font is medieval, and there is a 13th-century piscina in the east wall. The single bell is late 13th- or early 14th-century. In 1724 there was another bell besides. The plate includes a silver cup and paten cover of 1571. The registers begin in 1550.
taken from British History Online.